When Kanye West finally unveiled his new merch during his Madison Square Garden event, eager fans lined up to get their hands on The Life of Pablo pieces. 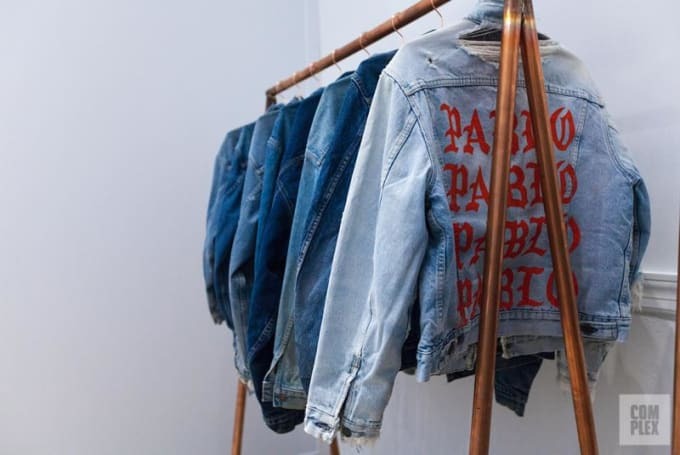 The merch then attracted an even larger crowd when West opened his "Pablo" pop-up shop in NYC, where he added more TLOP gear. Despite the pieces flying off the shelves, one of the designers behind it remained in the shadows—until now. Vogue recently caught up with Cali Thornhill DeWitt, a Los Angeles-based artist who had yet to speak on his involvement with the project. "I didn’t come out and say that I did it," DeWitt told Vogue. "I didn’t come out and say that I didn’t do it. But everyone who hit me up for interviews, I just told them, &apos;No, thanks.&apos; Because to me, it’s a symptom of the times: People wanna be known so much, you know?" The West collaborator first met Virgil Abloh in 2014. Abloh approached DeWitt about doing a collaboration. Together, they put together an installation at Dover Street Market Ginza that featured some of his tees. Abloh eventually introduced him to West, who commissioned him to make a DONDA sweatshirt. West asked DeWitt about collaborating on the TLOP merch only five days before his event at MSG, but he managed to get everything together in time. "One of the first things I said to Kanye was, &apos;Whether we do this or not, I appreciate your reaching out,&apos;" Cali said to Vogue. "Cause I’m sure they could have just ripped it off and done it themselves. So I thought that was nice." DeWitt might be unfamiliar to some, but the 43-year-old has been around the art and music scenes for a minute. He started working for Courtney Love and Kurt Cobain in the &apos;90s, before opening the record label Teenage Teardrops in 2000 in order to cater to the underground music scene in L.A.. He later co-founded the art space Hope Gallery in 2008. Now, in addition to several other projects, he runs his own experimental radio show. DeWitt only started showing his own art over the past three years. But, he had already became known for his text-based art and shirts. His designs were based off memorial sweatshirts, which were made in the Chicano community for family members who have died. When other artists stopped using the original technique to print the shirts around five years ago, DeWitt bought the materials himself to continue to make them. However, it might be the merch that helps DeWitt reach a larger audience and get copied by even more artists. Several people have made knock-off versions of the TLOP pieces since they were unveiled. West reportedly displayed some of these bootleg items at his "Pablo" pop-up shop, alongside DeWitt&apos;s original designs. Did New "The Life of Pablo" Merch Make its Debut at Coachella?